We are inviting current and recently graduated students to contribute to an exciting new book project. Contemplative and especially mindfulness practices are having an impact on all levels of education and are increasingly being taught as tools which can be used to address issues in a wide range of disciplinary areas. Consequently, as today’s students pursue their careers these skills and the understanding developed through their use will have an impact on the many pressing crises which now face us and seem primed to rapidly escalate. This anthology aims to bring the excellent work being done by many graduate students in a broad range of areas to a wider audience. In this way they can begin to contribute to and shape the future which is theirs. Please circulate this Call to your fellow students as well as to colleagues and students who would have an interest in participating. Western society has developed a rapidly increasing interest in contemplative practices and spiritual experiences both outside of and within its traditional educational establishments. Many students at all levels are now being taught a wide range of these practices in the classroom. Some are simply introduced to mindfulness techniques for the purpose of developing their ability to enhance studying and to cope more effectively with the stresses of their lives and education. In other classrooms their introduction includes practices to cultivate the insights and creativity needed to develop new ways of personal being which will issue in creativity in their area of study or performance. In other courses, students engage in advanced and in-depth study of traditional texts and techniques, often with a focus specifically on applying them to their professional interests. Their experiences and learning in all of these classrooms will influence the work for which they are preparing and the world that work will impact. While it is not the purpose of contemplative practices and non-religious spirituality to impart an ideology, a moral code or a particular prescription for the future, they can and do provide the tools with which students and citizens can challenge and change the status quo. There is now a burgeoning resource of books, journals, conferences and organizations devoted to these practices and their educational uses. These, of course, are typically produced by academics and researchers. They address a multitude of issues in the areas of pedagogic theory and praxis, the analysis and contemporary utilization of these practices, challenges to prevailing concepts of the autonomous individual and her/his isolated ego, their applications to specific disciplinary areas and much else. Millennia of practice as well as contemporary research show clearly that contemplative practices have the ability to challenge students’ relationships with their socio-cultural and ecological environments by fostering greater self-understanding and awareness of one’s interconnectedness with others and the world at large. Thus, available academic resources in these and other areas are essential to the ongoing development of this innovative pedagogy and the developments in students it can foster. But what is often missing in existing resources is the students’ perspective on their own learning experiences, personal development and visions of a new future for themselves, their broader community and the ecology. This volume is designed to begin to address that lacuna. A special focus of the works it contains will be students’ plans for the application of what they are now learning as they develop their careers and thus impact their world. This anthology will provide an opportunity for students’ voices to be more widely heard. Much of their work is of exceptional quality and it is the aim of this volume to provide an opportunity for some of the most promising recent developments in pedagogy and praxis to reach a readership beyond their teachers and classmates. In the course of their academic work they research, experiment and develop cutting-edge approaches to addressing a wide range of issues. In doing this they often cross the boundaries of the silos in which academic work is typically confined. We welcome work which engages multiple intellectual sites, media, creative arts and other areas to produce enhanced modes of understanding and innovative approaches to the future. Since this book will be adventurous in breaking traditional boundaries of academic discourse and critiquing established cultural and social practices, it will be of interest to a broad readership. Teachers and faculty at all levels, upper level undergraduates and graduate students will find stimulating works here. 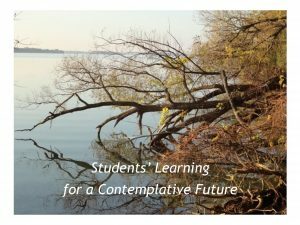 We also aim to engage recently graduated students outside of the academic environment who are utilizing contemplative practices in the particular areas in which they work or will be working. These would also include those doing practica, for instance teaching K-12, working to address global warming, social work, addressing poverty, psychotherapy, and a wide range of others. We are also pleased to accept work in different styles. Apart from essays, we will be interested in publishing anecdotes, case-studies and projects/experiments that involve contemplative practices. Artistic expression is strongly encouraged. Below we have provided a working Table of Contents. This is provisional and meant to be suggestive, not to confine the contributor’s discourse. It will be focused once we received the work to be included in the volume. It is well recognized that the silos created by academic disciplines can both hinder and distort the understanding of issues and hence greatly restrict the efficacy of attempts to address them. We encourage writers to transgress these boundaries as they seek deeper and more comprehensive understanding and more creative approaches for fostering a sustainable and humane future. Refer to this table only as a rough guide. Interlocking Challenges of Climate Change: Including Environmental, Economic, Neoliberal, Consumerist, Social and Political Issues. We encourage teachers to circulate this Call for submissions widely among both their students and other colleagues whose teaching engages contemplative practices. And students will have friends and colleagues who might wish to contribute so please forward this to them.